WASHINGTON — Small tech companies, consumer groups and many celebrities have been up in arms for weeks about a proposal at the Federal Communications Commission to dismantle landmark rules that guarantee an open internet. But in one speech, Ajit Pai, the chairman of the agency, called the complaints "hysteria" and "hot air." In another, he dismissed criticism that by pushing the change, he was doing the bidding for companies like Verizon, his former employer. He joked that his nightmare scenario would be refereeing a dispute between Verizon and Sinclair Broadcasting, another company he has been accused of helping with his policies. "How do you choose," he said, "between a longtime love and a newfound crush?" The agency was expected to vote on Thursday to dismantle the so-called net neutrality rules, which prohibit internet service providers from blocking or charging websites for higher quality delivery to consumers. It would also dial back the stance established during the Obama administration that broadband should be regulated like a utility. The three Republican commissioners, including Pai, have said they will vote for the proposal, outnumbering the two Democratic commissioners. Passing the plan would be the biggest victory in Pai's eventful 11-month tenure as the head of the FCC. Under his leadership, the agency has already opened the door for more media mergers, curtailed a high-speed internet program for low-income families and allowed broadband providers to raise rates to business customers. All this activity has made Pai, 44, a former lawyer for Verizon and a longtime government bureaucrat, the target of many angry protests. In recent days, government officials — including 18 state attorneys generals and dozens of Democratic members of Congress — have asked the FCC to delay the vote. On Wednesday, the attorneys general said that many of the 23 million public comments that had been filed to the agency about net neutrality appeared to be fraudulent. Pai has ignored the delay requests. But Pai's changes have also made him a pivotal official in the Trump administration's rush to shed regulations. 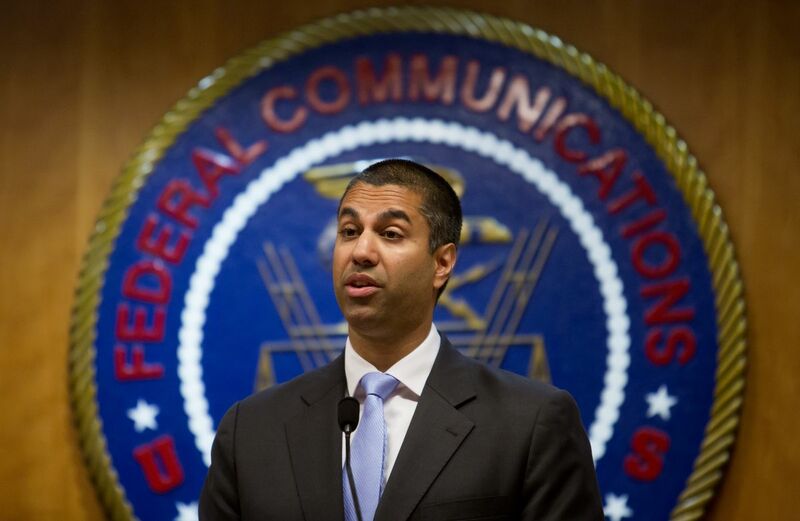 The effects of his decisions have rippled across the industries Pai oversees. The looser rules on media ownership, for example, has enabled Sinclair Broadcasting's $3.9 billion bid for Tribune. "Ajit Pai has the potential to be one of most consequential commissioners in the agency's history," said Gus Hurwitz, an assistant professor at the University of Nebraska College of Law, who is an expert in telecom policy and who supports Pai's proposal. Even Pai's detractors acknowledge that Pai has been efficient at moving his agenda. Mark Cooper, a staff member of Consumer Federation of America, said Pai has far outpaced his recent predecessors, even if Cooper does not agree with those efforts. "In every way," Cooper said, "his decisions are bad for consumers and good for big corporations." Pai declined to be interviewed for this article. But in a statement, the FCC said that he "has been focused on making the agency more transparent, closing the digital divide, and updating the Commission's rules to reflect the modern communications marketplace." The agency added that "the FCC has modernized its rules across a wide range of areas to encourage more competition and innovation." Pai's deregulatory fervor began well before the presidential election and his nomination by President Donald Trump. The child of immigrants from India who settled in Kansas, Pai was lauded by Republicans and Democrats when he was appointed in 2011 by President Barack Obama to the FCC. Lawmakers and public interest groups hoped the young nominee would bring a greater appreciation for how communications was shifting online than past commissioners. But for five years as a minority member of the FCC, Pai consistently voted against regulations such as those limiting business broadband prices and a broadband subsidy for low-income Americans. He complained that the agency's Democratic leaders, including Tom Wheeler, were too heavy-handed with companies. The biggest offense, in his opinion, were the 2015 net neutrality rules, which included the declaration that broadband would be subject to more utility-style rules. He said the regulations would burden the fast-growing high-speed internet market. In dissenting comments during the debate over the rules, he echoed the arguments of telecom companies that the FCC's net neutrality rules made it hard for telecoms to expand their networks, leading to less innovation in business plans and would eventually harm the economy. He also accused the White House of presidential interference in the activities of the FCC, an independent agency. Pai said that the agency had taken its direction only after Obama posted a video in favor of the net neutrality rules. "We are flip-flopping for one reason and one reason alone," he said at the time. "President Obama told us to do so." Pai's consistent opposition attracted supporters from free-market think tanks and conservative commentators like Rush Limbaugh and Roger Stone, a former Trump adviser who recently praised the proposal to scrap net neutrality rules. Pai became a frequent guest on Fox News and other conservative media and was praised in the editorial pages of The Wall Street Journal. "How fortunately ironic that it is Ajit Pai himself, as the Trump-appointed chair of the FCC, that will pull the plug on the ill-intended act called 'net neutrality,'" Stone wrote recently in The Daily Caller. Supporters of net neutrality argue that telecom companies want to become the gatekeepers of the internet, deciding whether sites have access to fast or slow connections. But Pai has responded by saying the bigger threat is from the big tech companies. Google, Twitter and Facebook, he argues, can deprive consumers of free expression. He says Twitter, for example, sometimes wrongly suspends users just because they do not share the same views as the company. "Let's not kid ourselves," Pai said last month at an event sponsored by the R Street Institute, a free markets think tank. "When it comes to an open internet, Twitter is part of the problem."